As an amateur pianist, I generally focus on the “classic” period of the Great American Songbook, including Broadway, from Gershwin to Rodgers and Hammerstein to Sondheim. I relate to that music, as I do to classic jazz (not the so called “smooth jazz.”) Just let me listen to a piano, bass and drums and I’m in heaven. Think Oscar Peterson or Bill Evans and so many other wonderful jazz pianists. A great vocalist such as a Stacey Kent is an added bonus. And I enjoy classical music, although my ability to play classical pieces on the piano is limited to those that have been transcribed for fake books. In effect, I have to improvise much of the music – not the intent of the likes of Beethoven, etc. My teenage musical “taste” gives me an opportunity to post something that’s been in my files for some 56 years now. Why I kept it, who knows. Maybe for this moment? 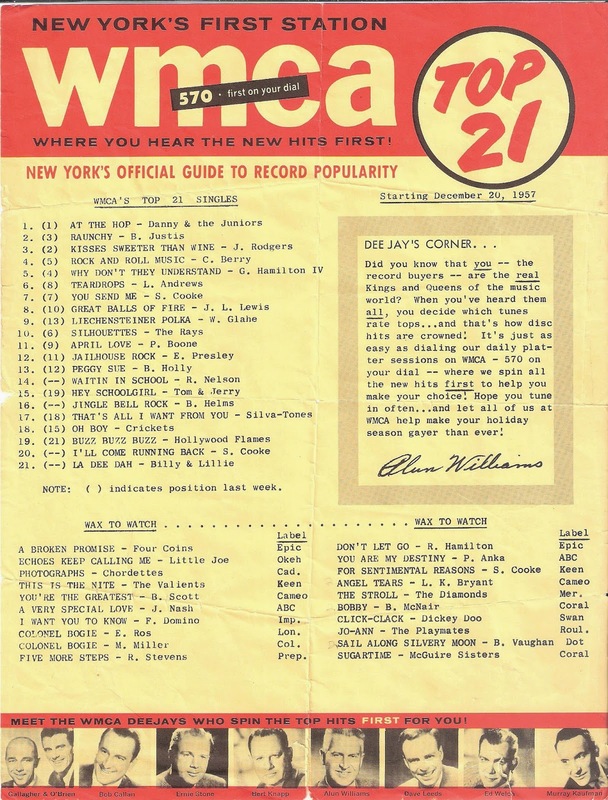 New York City’s WMCA distributed a weekly listing of the top hits at the local record stores where we would buy our 45’s. This particular one was for the week of Dec. 20, 1957. I still can hear (in my mind) most of the “tunes” listed on this particular sheet. Coincidentally, number 15 on the list for that week was Hey Schoolgirl sung by “Tom and Jerry.” They were a local pair, growing up only a mile or so from me. Never heard of them? Later they reverted to their real names, Simon and Garfunkel. They too tried to make a go of R&R but I don’t think any of their songs at the time rose higher than the one listed here. I’ve tried to keep up with contemporary Broadway / West End musicals but except for Sondheim, Andrew Lloyd Webber, and Claude-Michel Schönberg, nothing really appeals to me. But I’ve been remiss in not seeing (yet) works such as Nine and Rent. There is a song from each which I discovered in my fake books and I found myself playing them although I had never heard them before. From the more recent of the two shows, Rent, there is One Song Glory, which needs to be appreciated in the context of the lyrics and the story, but even without those, the music has a haunting leitmotif. So I decided to make a video of my playing it, but it’s digital size is too large for the limited software that BlogSpot offers, and to my chagrin I discovered that BlogSpot’s video postings do not play on certain devices, particularly mobile ones (where the entire digital world is moving – get with it BlogSpot! ), so I had to post my rendition on YouTube to play here. There are risks doing that, opening myself for criticism – any professional knows that I am but a rank amateur, but that doesn’t matter to me, I still enjoy playing. Unlike the other videos I’ve done its close up. This is not because I’m wild about my hands. After all, they are, together, 142 years old! : - ). But the sound was better with my little digital camera nearer to the piano. One Song Glory is a genre outside my traditional classic Broadway comfort zone. In other words, it doesn’t come naturally to me, but sometimes we have to forge into new territory…. The musical structure of Growing Tall, from Nine, on the other hand (no pun intended), is closer to the traditional Broadway musical, so I’m more relaxed playing this piece. Its digital size is within the parameters of BlogSpot, so I can bypass YouTube (although it may render it unplayable on some devices, sorry). Getting Tall is a very evocative conceit, the younger self counseling the mature version of the same person. Simple words, tenderness part of getting tall. Hopefully, that tenderness comes across….